One smartphone we have been hearing a lot about over the last few weeks is the Samsung Galaxy A8, the handset is now official and it will be launching in China. 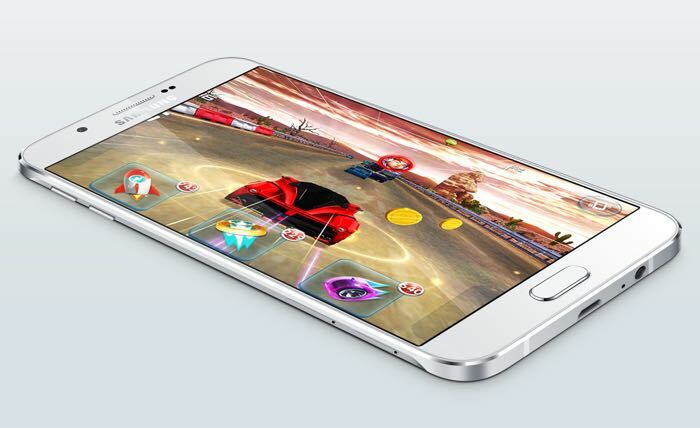 The Samsung Galaxy A8 comes with a 5.7 inch Super AMOLED display that has a Full HD resolution of 1920 x 1080 pixels. The handset is powered by an octa core 64-bit Qualcomm Snapdragon 615 mobile processor and also comes with 2GB of RAM, the device also features 16GB of built in storage. If you need some extra storage, then the Samsung Galaxy A8 features a microSD card slot which offers support fort 128GB cards and the handset also features a 3050 mAh battery, Android 5.1.1 Lollipop and dual cameras, the device also comes with a fingerprint scanner. On the front of the Galaxy A8 is a 5 megapixel camera and on the back of the handset there is a 16 megapixel camera, it will be available in three colors, white, gold and black. As yet there are no details on when Samsung will launch their Galaxy A8 smartphone outside of China, you can find out more information about the device at the link below.